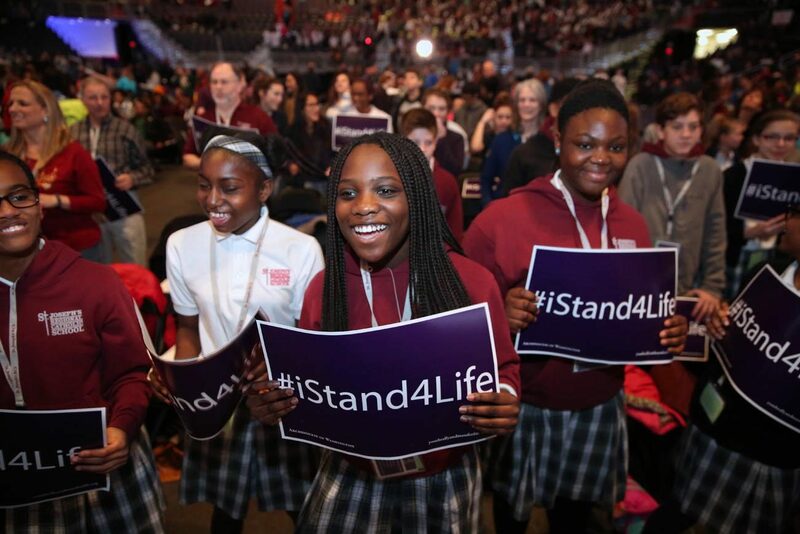 WASHINGTON (CNS) — About 10,000 young people from across the United States gathered at the DC Armory Jan. 27 to rally, pray and attend Mass before the annual March for Life. Arriving at the arena in the predawn darkness, some traveled as much as 10 hours to come to Washington to stand in defense of life. “I am here for a good cause. What is happening with abortion in this country should not be happening,” said Nathan Johnson, a high school student who traveled more than nine hours with 50 other young people from Kalamazoo, Michigan, to attend the rally. “We are the generation who has grown up with this, and we have to be the ones to deal with (abortion).” — Michigan high school student Nathan Johnson. Young people came from as far away as Massachusetts, New Hampshire, Missouri, South Carolina, Indiana, Ohio, Tennessee, Indiana, New York, Pennsylvania and Texas to fill the DC Armory. “We are the generation who has grown up with this, and we have to be the ones to deal with it,” he added. An additional 18,000 young people attended a similar rally and Mass at the Verizon Center in Washington. Both are sponsored by the Archdiocese of Washington. At the Verizon Center, Cardinal Donald W. Wuerl was the principal celebrant of the Mass, accompanied by Archbishop Christophe Pierre, the apostolic nuncio to the United States, along with cardinals, bishops and priests from around the country. As Cardinal Wuerl introduced each bishop, who came from dioceses such as Lincoln, Nebraska, and Portland, Maine, youth from their respective dioceses cheered. “Here, across this city, we all bear witness to this ‘Gospel of Life,'” said the cardinal, who told the Verizon crowd about the nearly 10,000 Catholic youth was gathered at the DC Armory. For the Mass at the DC Armory, Cardinal Daniel N. DiNardo of Galveston, president of the U.S. Conference of Catholic Bishops, was the principal celebrant. “We are going to offer ourselves as an expression of the beauty of life in a throwaway culture,” the cardinal told those gathered at the Mass. About 150 priests, including several other bishops from around the country, concelebrated the Mass. Father Shaun Foggo, a parochial vicar at St. Jude Parish in Rockville, Maryland, was the homilist. “People are confused to think that the most precious thing in the world — a human baby — could destroy their lives or destroy their plans,” he said. About 35 members of a youth group from Tennessee traveled more than 10 hours to attend the event. Aaron Allen, a Catholic school student from New Hampshire, said he traveled all night long to attend the rally, Mass and to march. Szczepanowski is a staff writer at the Catholic Standard, newspaper of the Archdiocese of Washington. Contributing to this story was Kelly Seegers, also on the Catholic Standard staff.